The KitchenAid Artisan Stand Mixer is the ultimate kitchen tool. Designed for high mixing performance home mixing, this outstanding food prep machine creates fantastic results every time. A stylish addition to your kitchen. The KitchenAid Artisan Stand Mixer is the ultimate kitchen appliance, helping you mix and blend your ingredients. The KitchenAid Mixer is a machine which cooks and bakers love using, the KitchenAid food mixer, with its smooth rounded bowl-lift, stainless steel accessories, and solid build. The KitchenAid Artisan Stand Mixer has full metal body construction, making it solid, durable and stable on your work surface. It boasts high precision metal gears and sturdy solid metal control knobs - a machine in every sense of the word. Despite this quality build spec, it is not noisy in operation like some other mixers. It's the quietest mixer in its class, with a smooth planetary action. Includes the 175 and 125. The 175 includes and additional bowl, pouring shield, 6 wire wisk, flex beater, dough hook and cook book. 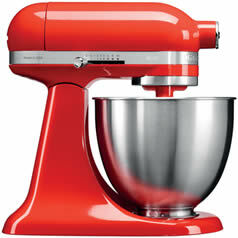 The New Kitchenaid Mini has all of the legendary power of the Stand Mixer but is now 25% lighter and 20% smaller. The KitchenAid mixer is an iconic piece of kitchenware, especially in homes in the US. It has also become increasingly commonplace here in the UK, and is available in Australia too. The design of the modern device has changed very little since the 1930s, but this isn't a detriment at all. The mixers are high quality, extremely durable, and they also have functional attachments that work with any generation of the same mixer. This means that if you have KitchenAid mixer attachments from 20 or even 50 years ago, and they still work, you can use them in your brand-new Kitchen Aid mixer. Alternatively, no matter how old your mixer is, you can use brand new compatible attachments. KitchenAid mixers have been manufactured for nearly 100 years, and they can still be found in commercial and residential kitchens around the world today. At ECookShop you can find discounted prices on a host of KitchenAid mixers, including the KitchenAid Artisan mixer and the KitchenAid hand mixer. Enjoy up to 50% off and, if you spend more than �50 on an order, we will deliver your new kitchenware directly to your UK home address. If you can't find exactly what you're looking for by browsing the site, call us and speak to knowledgeable and friendly staff, or call in to Dawson's Department Store in Clitheroe, where you will find our full stock of homeware items. The Artisan is the classic KitchenAid stand mixer. It has a 4.8L capacity mixing bowl and you also receive attachments and accessories to help you make the most of your new piece of kitchenware. 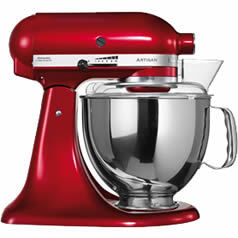 With the 125, you receive a stainless steel mixing bowl, a 6 wire whisk, flat beater and a dough hook. With the 175 you get an additional, smaller capacity 3L mixing bowl as well as a pouring shield, flat and flex edge beater, and the KitchenAid cookbook. The stainless steel mixing bowls are easy to clean and hygienic. The standard 4.8L capacity bowl is more than ample for most kitchen requirements, and if you only want to make a small batch then the small capacity 3L bowl is more convenient and easier to wash.
For those with more mouths to feed, the 6.9L KitchenAid Artisan mixer is ideal. It is a little larger than the standard Artisan mixers to accommodate the greater capacity of the bowl, but this means that you can prepare 50% more food, and you receive all of the same benefits as you do when buying the standard 175 models. Currently, if you buy an Artisan 6.9L mixer, you also receive more than �250 of free goods. This includes a coffee machine and a pasta roller. What's more, you also receive free delivery to your UK address and discounted prices on the mixer itself. KitchenAid changed the world of white goods in the 20th century by launching bright, new colours, and consumers loved them. As such, the company continues to provide its appliances and accessories in a gamut of hues. Candy Apple Red might be the most popular and it has certainly become the iconic colour of the brand's mixers, but it is only one colour from a spectrum of dozens. Choose the design that matches your kitchen d�cor, or that matches your other kitchen appliances. The Classic is the cheapest of all KitchenAid stand mixers, but it still affords buyers the same quality and the same benefits. It has the same all-metal construction and smooth, rounded design. It has the single attachment hub that is not only easy to use, but is also compatible with central hub attachments of any generation. It also uses what KitchenAid describe as a planetary motion to mix liquids and recipes. This motion helps ensure that every bit of the mixture receives attention, and it prevents you from ending up with ruined recipes. It does have a less powerful motor than the Artisan, and it has a slightly smaller bowl, but it is still more than powerful and large enough to cope with most kitchen requirements. The KitchenAid Classic mixer comes with a 2 year domestic guarantee and, if you buy now, you receive a 5 piece gadget set worth nearly �70 from KitchenAid, as well as free delivery from us. You can save money while buying a stand mixer from one of the most respected and best-known names in cookware items. If the Classic is still too large and cumbersome for your kitchen, then the KitchenAid Mini mixer is smaller still. The company say that the 3.3L bowl still has enough space to mix enough cookie dough for 5 dozen cookies but it is 25% lighter and 20% smaller than the original. Despite being smaller, the Mini fits all of the current central hub attachments, and it comes in a great variety of colours, as we have become accustomed to when shopping for any items from this US brand. The KitchenAid hand mixer is quick and very easy to use. Its convenience doesn't detract from its power, however, with a powerful DC motor, 9 speeds, and a soft start to ensure that you minimise mess and fuss. The handle has been designed with a soft finish, so you won't feel the after effects even if you are making up a large batch of dough or another thick recipe. You get two dough hooks, a wire whisk, a mixing rod, and even a protective storage bag to keep your hand mixer in when you aren't using it. As well as a 2 year manufacturers' guarantee, you can benefit from our discounted prices, giving you access to a cheap KitchenAid mixer that still offers all of the benefits of this reliable machine. One of the biggest benefits of buying KitchenAid mixers, like the Mini and the Artisan, is that they use the central attachment hub. This means that any central hub attachment can be used with any of these compatible models of mixer. Buy a Mini and you can still use the same dough hooks and the same meat mincer attachment as you would with an Artisan 6.9L mixer. Not only does this make it easier to find attachments, but it means that if you already have attachments from earlier models, they will still work with a brand new KitchenAid mixer. There are many different attachments too. Dough hooks are used to sympathetically mix dough for bread and other pastries. Meat mincers and sausage fillers can be used to create your own recipe of sausage for cooking at home, and these are just two of the more common attachments that you can buy. We have a large selection of official attachments for you to choose from. KitchenAid has developed a strong brand reputation over nearly 100 years in the industry. They are multi-award winning, and although they only manufacture kitchenware, they do design and release a lot of new products. They also create their items in colours and styles that suit any kitchen and that will meet your personal preferences for kitchen design. Buy a mixer than has the central attachment hub, and you can choose from any of the additional attachments that are made by the company. You also receive free gifts with most of the mixers, so you can get maximum functionality from your new stand mixer. 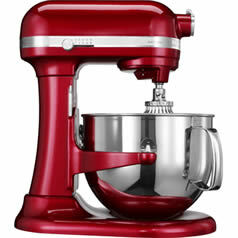 At ECookShop we have a large stock of KitchenAid items, and we regularly run a KitchenAid mixer sale. Enjoy discounts of up to 50% on some of the company's best known and most prestigious lines. You also receive free shipping on orders over �50, and KitchenAid themselves gives away free gifts with the purchase of certain mixers and other accessories and items. ECookShop is the official website of Dawson's Department Store. We sell kitchenware items from major manufacturers like KitchenAid, as well as tableware and cookware products. If you visit us in our Clitheroe based store, you will also find a large selection of other houseware items. We have bed linen, ornaments, barbecues, and even garden furniture to choose from. All of our items are priced competitively, and when you order online you benefit from free delivery on all orders valued over �50.